No goat keeper wants to see her goats bothered by flies. The nuisance is unavoidable, however, and the goat keeper wages a battle each summer to keep the pests away. Some avoid the use of chemical insecticides on or around their goats and look for more natural solutions. There is no silver bullet for fly control on goats, but a few good ideas put together make for an effective natural solution. Repelling flies naturally means applying a non-toxic spray to the goats' skin, and preventing flies from getting comfortable in the goat shed. Cheryl K. Smith in her book, "Raising Goats for Dummies," recommends a number of fly repellent ideas, including spraying the goats with a solution of citronella and water. Goat farmers find several methods of natural control effective. Treat the goat and the shed for the best results over a long period of time. By interrupting the cycle of reproduction, killing adult flies and keeping sheds clean, the fly population is reduced significantly. Battling the nose botfly often requires the attention of a veterinarian to treat the goats with a drench of Ivermectin. These flies not only torture goats by getting into their nostrils, but endanger their health by causing a loss of appetite, grating of teeth and stress from itching. Purchase fly predators. They are beneficial insects that kill fly larva before they mature. Fly predators are found on the Internet at farming supply websites, or through suppliers of beneficial insects for gardening and farming. Introduce these each month during the warm season, or year-round if you live in warm climates. Chickens and ducks are also great friends of livestock. Let the birds peck in areas near where goats eat, sleep and play to keep the fly population down. Absolute cleanliness is one of the best fly repellents. If there is nothing to eat and nowhere to breed, the flies won't stick around. Muck out and sweep the sheds and outdoor pens daily. Change bedding weekly. Keep the floors dry and clean and sprinkle agricultural lime on them. Do not use white lime; it is caustic. Agricultural lime is gray and dries out the floor, making it hard for microbes to grow. Fewer microbes, fewer flies. Another simple trick for fighting flies is plain old sticky ribbons. Buy a dozen of these to hang from ceilings of sheds out of reach of the goats. 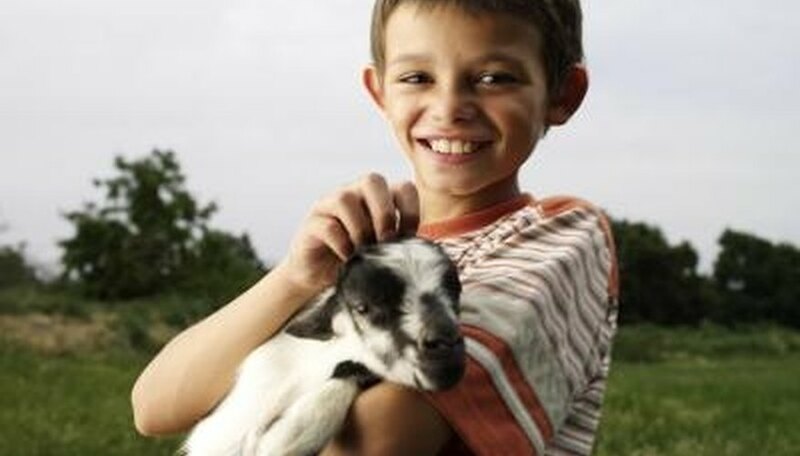 Goat farmers have tried a number of homemade solutions that have not been tested scientifically. These include spray solutions made with lavender, penny royal, mint and cedar oils. Internal supplements of garlic and brewers yeast are recommended by some. Washington State University Cooperative Extension; Your Dairy Goat; Robert W. McNulty, et.al.